The holidays are here, and we are just as excited as you are to decorate and get into the spirit. 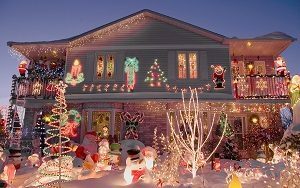 Before you go overboard on decorating your lawn, porch, or anywhere else on your property, remember there are some downsides to overdoing it – lights can burn out, you could blow a fuse, injuries, power outages, etc. You need to make sure you have everything you need and are prepared for the worst to happen, like your favorite string of lights no longer working or your favorite light up reindeer no longer lights up. Let’s look into how you can guarantee the safety of yourself and your home. When you decide to start your decorating, find a buddy to be there with you. You will need someone to stabilize your ladder for areas that are up high and all-around help with the lights. Make sure your ladder is always on level ground, the last thing you need to go to the hospital when you are trying to be cheerful. An extra eye on the decorations is always a good idea. Make sure you utilize surge protectors along with heavy-duty extension cords that will protect you and your circuits. You do not want to put in a bunch of time and effort into your display for the lights to short out. Make sure you are using outdoor extension cords for your displays and not mixing them up with your indoor ones. It is everyone natural inclination to throw away extra bulbs and fuses. Save them for later in case you need to make replacements. This will also save you frustration for next season when light bulb number 41 decides to no longer work. Also, be aware that your 50-light string from a few years ago will have a different amperage than the 100-light string that you bought today. As a general rule of thumb, you should be sure that all of your lights have the same amperage, it would also be beneficial to buy a new string of lights every year. Before you jingle all the way, map out your lighting endeavors. You do not want to run out of lights close to the end of your project. Buy more than you think you need, even if you already have them, stock up for the possibility of them not working. The current being used for the bulb that just ran out is now being transferred to the remaining light bulbs. This continues to happen as more bulbs are dying. Instead of that unfortunate series of events happening to your favorite string of lights, replace them right away. Keep an inventory every so often of possible bulbs that have burnt out, walk around your display. This may seem like a tedious task but will be beneficial to you in the long run. When wrapping the lights around your trees start from the bottom and work your way up to keep consistency throughout your display. You could also consider purchasing net lighting, this will be easier to put over your shrubs, and will be a quicker clean up when it is time to pack them away. Although you want to keep your lights on all day and all night, make sure you shut them off at a reasonable time. If the lights get too warm, they could create a fire. Even if you have the most hydrated tree, you need to be aware of the risks. If you want to make your home into winter wonderland, but you do not have the time to do so, call the professionals over at Greener Horizon. We can get your landscape ready for the holidays to impress all your guests with how amazing your yard looks. Before you call us, be sure to know what you want on display. Tell us how large your landscape is, what lighting features you want, and when you need the installation completed. We have experts that know all the do’s and don’ts of holiday lighting, and it is our promise to you to provide the highest quality service.